In January 2015, we were tasked with finding a way to make the lives of students with hearing loss the best that they could be. We spoke with the Disability Resource Center at UGA, surveyed over 60 individuals with some degree of hearing loss and interviewed an educator who has worked with deaf students. What we learned from these interviews and surveys and from further market research is that current methods of connecting students with disabilities often come in the form of group sessions which can be both awkward and time consuming. Further, the world of social media can be highly exclusionary, and there is no tool targeted to individuals with disabilities for the purpose of building dialogue. Tribe was created with the goal of connecting students both with disabilities and without on their campuses and on their own time. 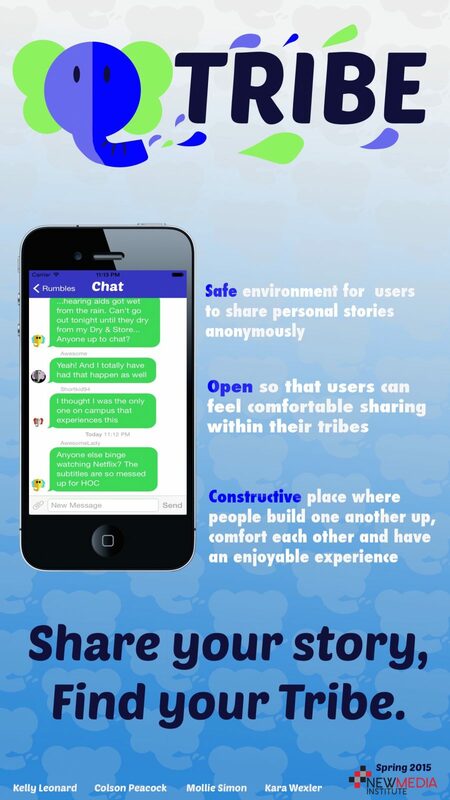 Our native application allows users to message one another within Tribes sharing similar interests and stories. Our plan for getting Tribe into the hands of those who would benefit from it is to grow slowly and organically. Initially, we plan to target the hard of hearing community at UGA. From there, we want to expand to other UGA communities and tribe before moving to another campus. We plan to spread community to community and tribe to tribe.